Two Bears Farm and the Three Cubs: Fitness Recap May 2011 - A Great Month! Fitness Recap May 2011 - A Great Month! This picture is of a Quadballer, which is a form of TriggerPoint therapy. 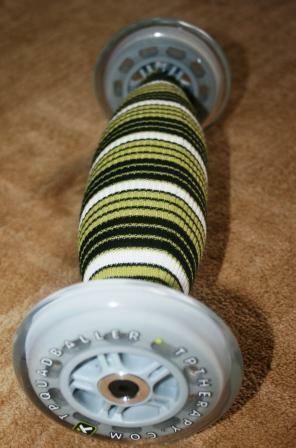 It works much like the foam roller - to massage stressed muscles. I've been using it on my IT band this month and it is so much better than the foam roller. I've also continued with my ART (Active Release Therapy) sessions. 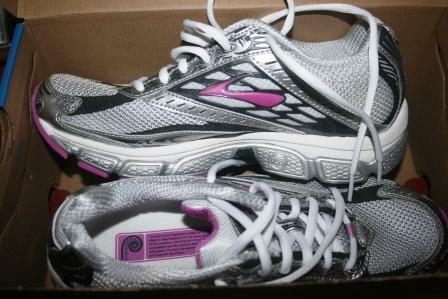 And the boys got me a new pair of running shoes for Mother's Day - I'm trying a new brand (Brooks) which I don't normally do. But they feel much like my beloved Asics and so far so good. Bottom line? I've had a most excellent month! Still trying to take things gradually, of course, but my IT band isn't hurting lately. I was even able to get out to the track for some workouts this month! I had kind of hoped to get in a race this month, and had been thinking of a local 10K, but at the last minute I decided not to. I'm very slow right now, and knew I would've been disappointed with my time. Maybe in June I'll get a race in. In the meantime, for your convenience, I've compiled a list of convenient excuses in case you skip a race (and - like me - are such an early bird that you can't use the whole 'slept in' excuse). 1. My running clothes were dirty. 2. My chicken told me not to. 3. I prefer to race in poor conditions - the weather was just too nice. 4. I'd rather run 9 miles on my own. 5. I needed to blog that morning. 6. I didn't want to miss breakfast. 7. My legs were too sore from my track workout - 4 days earlier. 8. I forgot to download the registration form. 9. I heard they didn't have portajohns. 10. My twins ate my running socks. My Weight Watchers goal this week was to do at least 30 mins exercise every day... I have so far managed two days - and my week ends tomorrow! Just found your blog - would love it if you stopped by mine sometime. I am happy that things are going better. I think the twins need more fiber in their diet. I'm not a runner, but I'll use some of those excuses as to why I don't walk every morning! Thanks! Congrats on your month! The Quadballer looks and sounds scary! I'll pass on that. See you on the track next Tuesday? loved the list. glad your may was a good month! i know how much that means to you! I LOVE Brooks...have been wearing Brooks Adrenaline for years. Yesterday I so wanted to stay in bed...even purposefully didn't set my alarm until the time I needed to get up just to make it to work on time and wouldn't you know I woke up at my workout time...I tried everything I could to convince myself to stay in bed. BUT that hot brown I had been craving for 2 weeks (and had on the menu that night)...well I really wanted that...so up I went and ended with a great 3.6. BUT loved your reasons...I've used several myself :). I LOVE your list!!!! The last one is my favorite!!! And I like that pink on your new shoes, too! I am still having trouble walking and standing, it will be awhile, I go back to the doctor today. Run for me, girlfriend!!! When are you coming to the book fair? HAHAHA! I need to print out that ten excuses.... I totally could use them! Hey, also good to know... I have only used the foam rollers. I'm so happy for you! May was miserable for me because of my new injury. But reading this -- oh well, one can't just give up, so I guess I will be back to it after I see the doctor next week. Isn't it very hot to run in the summer where you live? You are so inspiring with your dedication!! Those socks will surely fill the twin's fiber quotient for the day. Im hoping to start jogging soon. Im making my 10 yr old do it with me. Im a little nervous! Im not very good at running. Love the excuses. What makes them so funny is that we all actually use these kind of excuses. Nice to meet you, first of all. Found you through a comment you left on Shell's blog. You had me at "runner" in your profile! I just started running last year (Feb 2010) and have come such a long way in that time! I've never heard of the quadballer. I own a foam roller but rarely use it anymore. I had some IT band issues about a year ago and was afraid it was going to be the end of running for me so I started doing a lot of learning about running. Ended up changing my running form and am now a full on minimalist runner that is dabbling in barefoot running! Which is crazy to me! 90 miles? that is awesome!!! Love the list of excuses! You are inspiring me to maybe just maybe get myself moving!